The speckled ones are my favorite. Surprisingly the speckles are slightly raised, creating a somewhat sandpapery feel. That can’t be pleasant for the hen. Poor little lady. I don’t have any idea what causes them to have/not have spots, but it’s always a fun surprise. Just another reason I adore our chickeneez. Silly question – what makes eggs brown? When I was little my great-grandma had chickens and I always thought the brown eggs were special. To this day I buy brown eggs because they remind me of visiting her in her elcerticity/water free home. She lived simply with an outhouse through the mid 80’s. so… do the brown eggs just happen or is it a certain bird that lays them? 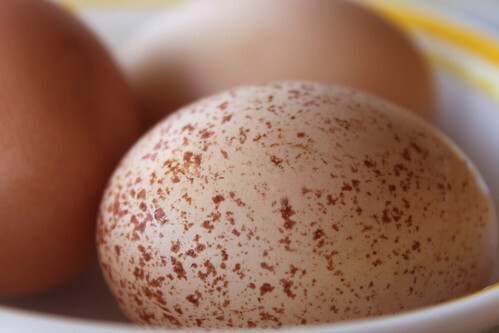 Hens with red ear lobes usually lay brown eggs. White lobes usually means white eggs. Some hens lay green eggs, but I don’t know what color their lobes are. 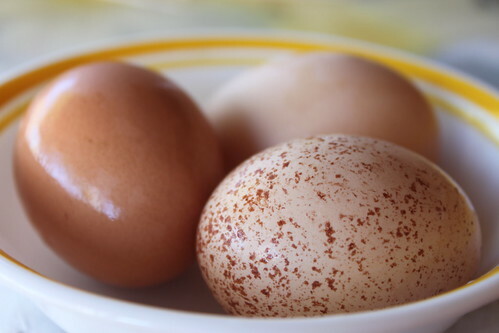 The color and size of the egg just depends on what breed of hen laid it. Nostalgia for my Grandmother’s house when I was little definitely played a role in us keeping hens. It was so much fun to collect the eggs for her. My grandfather would sooner eat a rock than a store bought egg. I didn’t understand it until I got my own. There really is a difference. I will bring you some eggs whenever we get around to hanging out. I can’t imagine living without running water. I can barely make it through the weekend with no internet. Can you say spoiled rotten brat?